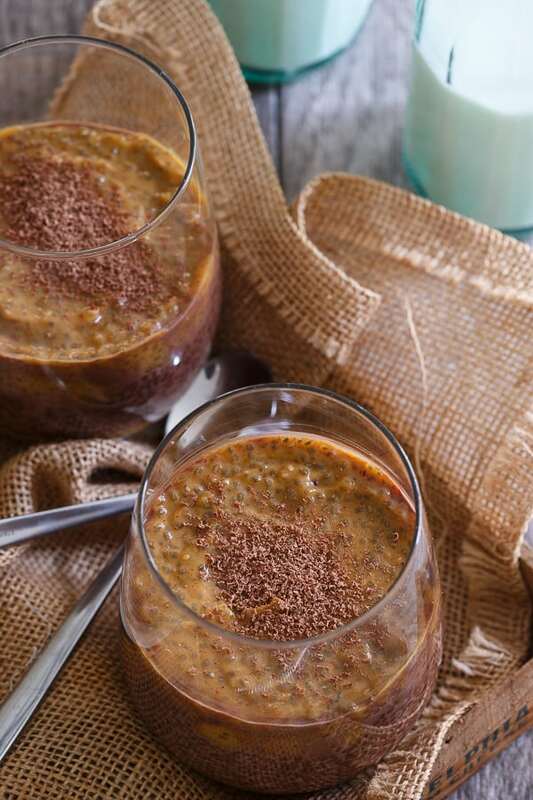 Layers of pumpkin and chocolate chia pudding make for a great snack post workout snack or even a delicious healthy dessert. The last 3 weeks at CrossFit have literally been packed with PRs (personal records). I’ve added 10 pounds to my clean, 15 pounds to my overhead squat, 5 pounds to my back squat, 10 pounds to my front squat, 5 pounds to my shoulder press and just last night came the closest I’ve ever come to a ring muscle up. Like *soooo* close. If you know anything about CrossFit, you know that’s like the benchmark movement. I also don’t feel like dying quite as much during the conditioning portions of the workout and there’s literally only one thing this can all be attributed to. I mentioned how I was working with a coach from Renaissance Periodization for a 3-month nutrition plan a few posts back and seeing how every single one of these PRs has happened during the 3.5 weeks I’ve been following their nutrition guidelines, I’d have to say it’s working. My very first thought when I looked at my plan was “woah, carbs”. I was definitely being told to eat a ton more carbs and protein surrounding my workout time than I was used to but considering I’d felt stagnant on almost all of my lifts for literally almost a year at the gym, I was happy to oblige and see what happened. 3.5 weeks later, 5 PRs are what happened weighing 2 pounds less than when I started. There are a ton of snacks and smoothies on this site, many of which are protein packed and great for pre or post workout but using what I’ve learned nutrition wise from the last few weeks, I wanted to put together a snack/dessert that works even better with my current macro-nutrient plan. 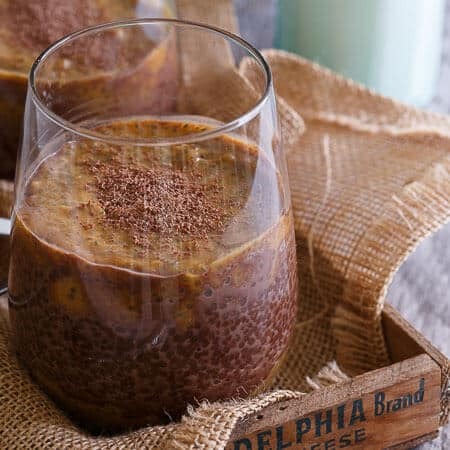 This pumpkin chocolate chia pudding uses medjool dates for a carb boost, healthy pumpkin and dark cocoa powder, chia seeds (a superfood filled with healthy fats and protein) and of course, good old dairy milk for it’s excellent protein content. 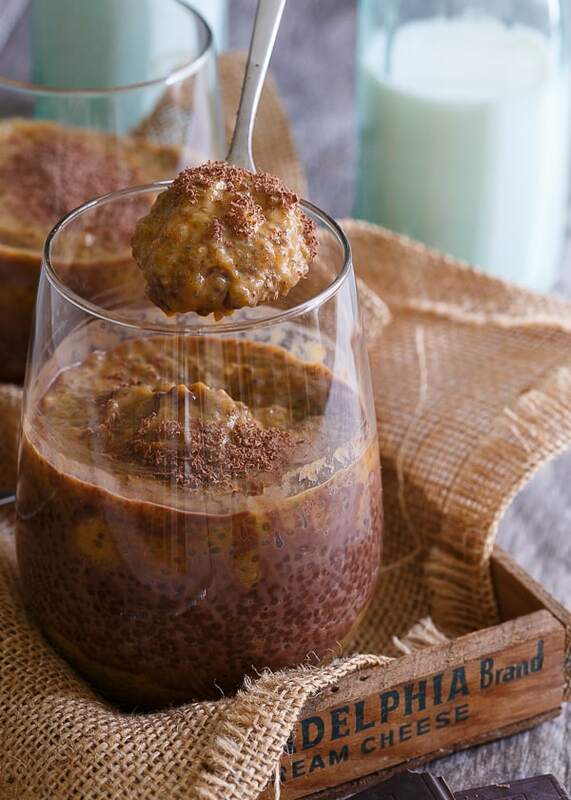 With 1 serving providing 8g of protein, it’s the perfect ingredient for this chia pudding as a workout recovery snack. Chocolate milk has been long been touted as the “perfect” workout recovery snack since it’s a great balance of carbohydrates and protein. 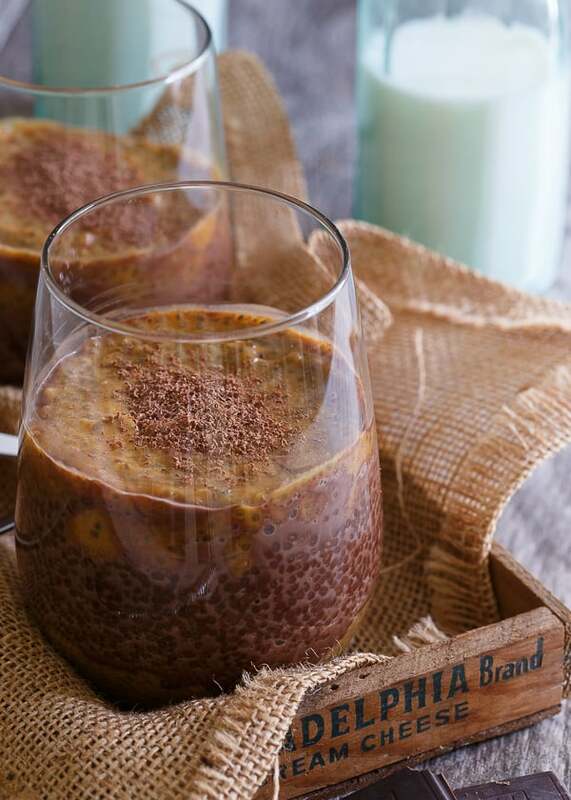 This pumpkin chocolate chia pudding is my fancy fall version on that classic. Dairy Management Inc. puts together a video series called Acres + Avenues which brings rural dairy farmers and young urbanities together to not only illustrate how the dairy products they love get from the farm to the table, but also to celebrate the shared passions that unite them. Their latest episode brings boxing coach, Dana Chubb and NY dairy farmer (did you know NY ranks 4th in the nation for dairy farming?) and registered dietitian, Abbey Copenhaver together to spend a day in each other’s shoes. As a boxing trainer and international kettlebell competitor, Dana realizes the foods she eats needs to pack a nutritional punch to keep her healthy in and out of the gym. As someone with a shared appreciate for nutrition, Abbey helps explain the farm to table story of dairy milk to Dana, as well as test her skills in the ring. If there’s one thing Dana, Abbey and I can all agree on, it’s that nutrition matters when it comes to workouts. Properly fueling your body makes a huge difference in performance and when there’s pumpkin chocolate chia pudding to help you do so, why wouldn’t you?! Love chia pudding? Check out these pumpkin pie chia pudding parfaits from last year or this layered strawberry guava chia pudding for something more fruity! Combine all the ingredients except chia seeds in a blender and blend until smooth. Pour mixture into a small bowl, stir in chia seeds, cover and refrigerate overnight or for at least 4-5 hours until thickened. Combine all ingredients except chia seeds in a blender and blend until smooth. Spoon alternating layers of pumpkin and chocolate pudding into small glasses, jars or cups to serve. Top with shaved chocolate for garnish. *This post is sponsored by the ADADC. All content and opinions are my own. Yum, I love finding new ways to eat chocolate that don’t count as dessert! Okay this chia pudding looks amazing – and how exciting about all your PRs! You must be thrilled! I LOVE these photos, btw. I would be SO down with this pudding. This sounds amazing!! And hooray for all those PR’s I”m going to check out the Renaissance Periodization, my boyfriend is suffering from some pretty bad GI issues and we are trying to get his gut in check. Woohoo for PRs! It’s the best feeling! Love the pumpkin chocolate combo! I’ve been loving an oatmeal I’ve been making with cocoa pumpkin and chia! Couldn’t agree more that proper nutrition fuels good workouts! And indulging in dessert for a healthy snack? Sign me up! Healthy snack and guilt-free way to enjoy something sweet any time of day? Love it! Definitely will have to make these asap. I LOVE this chia pudding, its one of my favorite snacks! And good for you with your PR, you are killing it! Great job on the accomplishments! I, too, have been consulting with a dietitian to tweak my macros. I’m an avid runner/triathlete, who had a pretty clean diet. My original goal was to change my body composition, but what I’ve gotten in return was some of the strongest runs I’ve ever had. Although my body composition is slowly changing–thank you hormones–I couldn’t be more pleased with my performance–and I’ve learned that’s what’s most important to me. Keep up the great work and I hope you crush more PR’s in your future! This is a great post or pre workout meal! I love the idea of using dates to sweeten, they are natures candy! A dessert I can feel good about! I love the dates in this recipe! P.S. Chocolate + pumpkin = ahhhhhhhhmazing. Any suggestions on a sub for the vanilla bean paste? I cannot seem to find this in the store. Also, how many servings does this make? You can just use the same amount of regular vanilla extract instead. It’ll make about 4 servings.